Drakenstein Stud’s champion sire Trippi could make his presence felt in the 2019 US Triple Crown. The G1 winning son of End Sweep is broodmare sire of two three-year-old colts who were made eligible for this year’s Triple Crown by the January 26 early nomination phase deadline. Trippi is broodmare sire of both Dressman and Signalman –both of whom have been made eligible for this year’s Triple Crown –consisting of the Kentucky Derby, Preakness Stakes and Belmont Stakes with both colts have already shown tremendous promise. 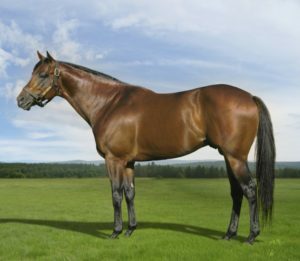 Signalman, a son of unheralded stallion General Quarters and the Trippi mare Trip South, has already shown himself to be among the leaders of his generation. Trained by Kenny McPeek, the colt has won or placed in four of only five outings and last time out won the G2 Kentucky Jockey Club Stakes at Churchill Downs. Also placed in both the G1 Breeders’ Cup Juvenile and G1 Breeders’ Futurity, Signalman has already earned more than $440 000 in stakes. Trippi mare Frolic’s Appeal is the dam of the very promising Bob Baffert trained 3yo Dessman (by Union Rags). The latter was named a TDN rising star following a seven and a half length win on debut and Dessman clearly has the potential to be very smart. Other notable performers out of Trippi daughters include the graded stakes winners Liam’s Map, Miss Sunset, Multiplier and Not This Time. South Africa’s Champion Sire of 2015-2016, Trippi is the sire of 73 stakes winners to date, including the G1 winners R Heat Lightning, Lobo’s Legend (who was entered for the 2019 Hong Kong Derby), Inara, Real Princess, Deo Juvente, Afrikaburn and For The Lads.